Which US States are Tax Friendly? If you’re looking to start a small business, it pays to know which states are and aren’t optimal to do business in. According to the Tax Foundation, a Washington, D.C. based tax research group, below are the 4 best and 4 worst states to do business in for 2017. Wyoming earns the top spot, in large part to the state having no income or corporate taxes. Additionally, Wyoming does not compensate for this by raising state taxes. South Dakota is business friendly due to its low unemployment rate which comes in at 4.4 percent. This unemployment rate isn’t the lowest in the country (North Dakota and Nebraska are lower), but coupled with low corporate taxes, it beats out other states. Thanks to oil and gas companies, Alaska boasts a high total revenue per capita; however, a favorable state economy, a low unemployment rate and an absence of income tax offsets this number. Like the previous three states, Florida does not have a personal income tax. Additionally, the state boasts a low corporate tax (5.5%) and bountiful tax deductions so that many businesses (upward of half) don’t pay taxes whatsoever. Sole proprietorship and partnership business owners in Vermont should be prepared to pay high individual income taxes. The highest bracket pays a whopping 8.95 percent. Although California isn’t hurting for attracting employers and has a relatively low individual income tax rate, it comes in at sixth worst in terms of corporate taxes. While NY has a relatively favorable corporate tax rate, the state’s high property taxes, high unemployment and the worst individual tax rate in the country keeps it in the second worst slot. New Jersey has solidified its spot as the worst state to open a small business due to property, state sales and individual income tax policies. 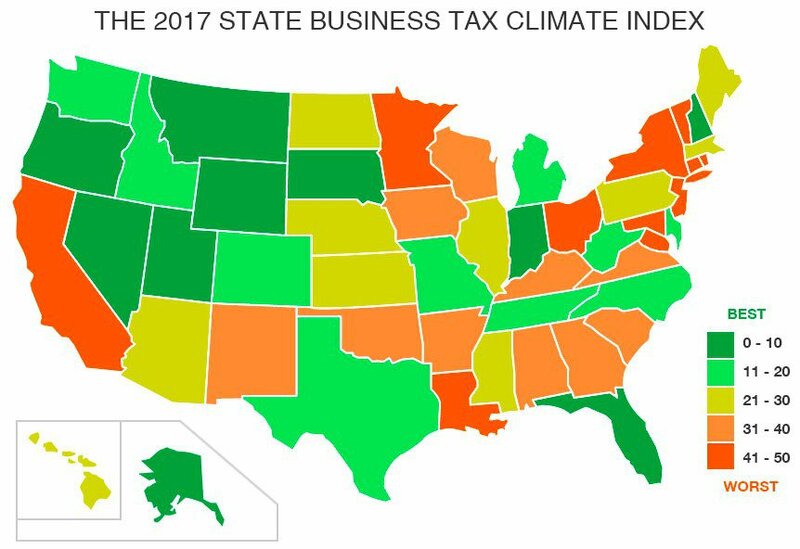 For more information about the criteria the states were judged on, continue reading our article: Which States Have The Best Business Tax Climate, and remember to browse MaxFilings’ blog while you’re here!